Ah, the captivating natural beauty, soft and gentle lighting, and reputed health benefits of Himalayan rock salt lamps . . .
Halite is the mineral name for the substance that everyone knows as “salt”. Its chemical name is Sodium Chloride, and a rock composed primarily of Halite is known as “rock salt”. Pure Halite is colourless and translucent. It is the impurities that give the salt its colour; in the case of the pink hues of the Himalayan rock salt, it is Iron Oxide. Where and how does it form? Salt deposits form in dry lake beds, inland seas and lagoons, due to the evaporation of salty water which contains dissolved Na+ and Cl- ions. The salt gets buried by other sediments but its low density allows the salt to move and collect into large underground domes. The rock used for our lamps was sourced in Pakistan. Yes – you may notice the lamp exhibit “sweating” on its surface. Moisture is absorbed from the atmosphere by the salt and is driven off again by the warmth of the bulb – a normal process that drives the air purification effect of the lamp. It is best to keep it away from excessive moisture or humidity, such as a kitchen or cellar, and use it indoors only. We also advise you to place the lamp on a dish since dripping moisture may mark the surface it is resting on – and if that surface is metal, there is a risk of it being corroded away because of the chemical interaction of salt water and metal. So, ensure the lamp is kept dry. You can clean it using a damp cloth, or brush off crumbling salt with a tissue. Do not apply cleaning products, or immerse it in water. Be extra careful when you’re handling the lamp, as salt is brittle and breaks easily; and these lamps are rather weighty and typically asymmetric – so, possibly tipsy or topside heavy. They can be a falling hazard due to their weight – so be sure to position the lamp in a safe place, inaccessible by babies and young children. Take care to place your lamp away from curious pets, or train them to stay clear. To be specific, salt lamps are dangerous to cats, since it can cause salt poisoning. The lamp is for decorative use only and should not be left turned on if unattended for long periods. Are there really health benefits from using a salt lamp? 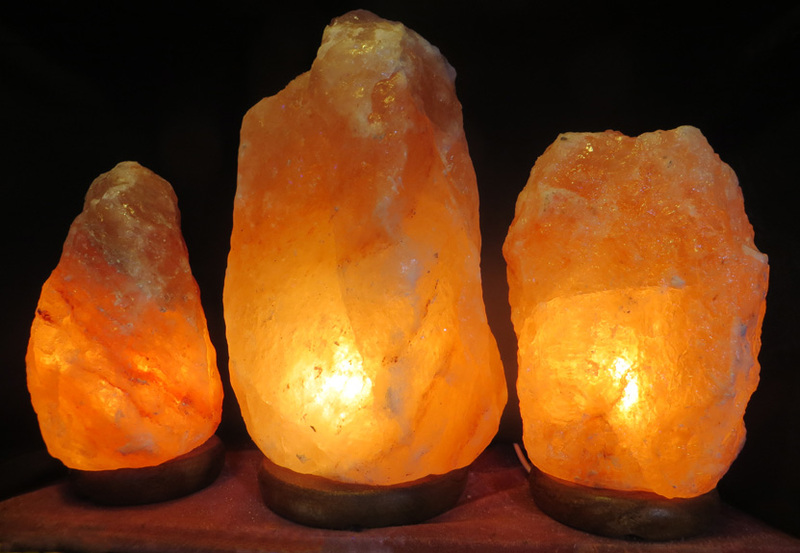 We have heard it said that heat from the bulb releases negative ions from the rock salt which purifies the air, reducing allergens, and producing a positive, soothing effect. However, there is no scientific evidence that these lamps produce meaningful amounts of negatively charged particles, or that they reduce pollutants in the air. With just 15 watts of bulb heat driving such a purge, sadly the theory makes no sense. However, you’ll find your lamp will make an attractive addition to any living room, bedroom or hallway. When they are the only source of light in a room, they look truly magical, like a sacred artefact or a flame frozen in time. The calming and heart-warming delight this vision can present is a much more assured health benefit! Can the bulb or lead be replaced? If the bulb conks out or starts flickering, turn off the lamp at the mains outlet. Unscrew or pluck out the fitting from the metal collar (please bring it in if you require assistance), and insert a fresh 15W E14 Pygmy “oven” bulb. If the external flexible cord is damaged, do not switch on this lamp; and contact us as we may be able to provide a replacement. Has this lamp been tested? The fittings for every salt lamp we sell have passed standard testing (BS EN 60598-1:2008 and BS EN 60598-2-4:1998), along with testing by us in the shop, and comply with The Electrical Equipment (Safety) Regulation 1994.